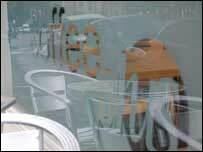 A new style of coffee house has opened in Bristol with all the profits funding cancer care and research. Coffee Plus, on Whiteladies Road, is a first for Tenovus, one of the UK's leading cancer charities which already has five charity shops in the city. "Coffee Plus is a new way to raise money and awareness of Tenovus in an innovative way," said Claudia McVie, Chief Executive of Tenovus. Casualty actor Joanne King who plays 'Cyd' in the drama will open the venue. "All the profits from Coffee Plus will help pay for not only for our teams of frontline staff who work day in day out caring and supporting cancer patients, but also for our extensive cancer research programmes," said Ms McVie. "Tenovus has been instrumental in the development of Tamoxifen - the world's most successful breast cancer drug that is estimated to have saved the lives of 30% of women diagnosed with breast cancer." The charity is in talks with the Princes Trust to offer training opportunities to disadvantaged young people in Bristol. Peter Searle, commercial director for Tenovus, added: "It may be a crowded market place, but there is a strong demand for good quality products and service. Our customers have the added benefit in knowing all our profits support cancer patients and their families."